Becoming a PA seemed to be a foregone conclusion for Tony Martin. He says he’s always liked helping people, and his first opportunity to do so came in high school when he became a junior volunteer at a local hospital for patient transport. That lit the spark for him. Later, Tony joined the Pennsylvania Army National Guard and trained as a combat medic, and from there he entered a surgical technologist program. His fate was sealed. The idea of spending years and years in medical school seemed daunting, and Tony said frankly he doesn’t consider himself the “ultimately responsible person.” That’s why he likes being a PA who can assist in surgeries, helping out as he can, but still have a doctor to back him up. But once he’s in the OR, he’s focused, prepared, and early. Tony’s been a PA for 26 years, and has been on 19 locum tenens assignments. He feels like locums complements his way of life, and plans to continue doing so for the foreseeable future. The origins of his locums story is a somewhat convoluted one. 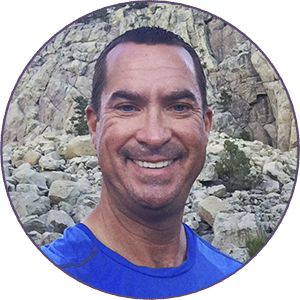 His first assignment found him in Grand Junction, Colorado, which he enjoys going back to for many reasons: the hospital and neurosurgical practice where he works, the town itself, and the surrounding mountains. He likes it so much, he’s taken five assignments there, and Grand Junction is where he caught the hiking bug. For those not in the know, a 14er is a mountain peak with an elevation of at least 14,000 feet. There are 96 fourteeners in the U.S. — all west of the Mississippi — 53 of which are in Colorado. And once you get the bug, there’s no turning back, Tony says. Tony is a self-identified vagabond at heart; he loves the “gypsy” life. Being single with no kids, he relishes the opportunity to travel and meet new people, learn new things professionally and stay sharp as a PA.
His brother usually stays to watch over his home in Pennsylvania while he’s on assignment. “It makes it easy for me to travel and if I need to extend longer at an assignment, I can. I’m very flexible with that,” he says. Though Tony loves the locums life, he does mention one downfall: loneliness. He’s found, though, that since he sometimes returns to the same facilities, those he works with know him and they just pick their relationship up where they left off. Aside from the travel and sightseeing opportunities, Tony’s found that locums is a great way to learn new techniques and see how a facility is run before you decide to sign a permanent contract. Tony feels the locums lifestyle suits him perfectly, and plans on working locum tenens for the foreseeable future.